Hi baseball fans! My name is Adrian Cardenas and I was traded this past year from the Philadelphia phillies to the Oakland A’s. I was born on October 10, 1987 and actually turned 21 here in Arizona. I was born and raised in Miami, Florida and I’m Hispanic (both my parents were born in Cuba). I guess a little about me that most may not know is that I started playing the piano when I was 3 years old and played it until I graduated high school (Monsignor Edward Pace) and got drafted in 2006. It’s pretty funny but my parents didn’t know much about baseball and I really started playing at 5 years old just to keep family ties when my family along with my uncle’s family moved away from the same neighborhood. However, they instilled in me hardwork and dedication, which I am a strong believer that it has carried me here thus far. Since I can’t carry a piano around everywhere I travel, I usually bring my guitar. I’m not very good, but it definitely is one of my favorite hobbies and something I enjoy doing pretty much everyday. Attending the AFL this year was one my goals just because I was eager to be thrown at a young age with the best competition and not only pick people’s brains, but also be exposed and play among some of the best talent in the minor leagues. Although I am here to “show what I got”, I am also here to develop. I am constantely trying to work on things and get better before, during, and after games. I feel content with my playing in the AFL, but realize that there is still a lot work to be done. Hope you enjoyed the blog! Hello Baseball fans and welcome back! What an exciting week in the AFL. This week the Desert Dogs improve their record to 8-8, which is still good enough for second place in the National Division behind the Peoria Javelinas. After my last Blog entry, I had a few questions about autographs. The First question asked if I received many requests via mail for autographs and do I have time to respond to them. The second question asked if I received mail during the season and how it felt when I got my first baseball card, also if I am a fan of baseball cards myself. Throughout the course of a season I would say I receive about 5-10 pieces of mail a week from fans asking for autographs. The first time I received fan mail I was sort of taken back, because I can remember when I was young sending letters and cards asking for autographs to my favorite major league players, just dreaming what it would be like to be in their shoes. Here in the AFL I would say I receive more mail than that during the season. I always have time to sign autographs, but what I usually do is wait until I have a small pile of mail and sign all at once. I enjoy taking 15-20 minutes to sit down and read the letters to hear what the fans out there have to say (being that I was in their shoes just a few years ago). As for my first card, I remember last year being in Stockton CA during the last week of the season and was asked to sign a few autographs. After signing a few balls and Stockton Ports cards a fan pulls out a Bowman Card with me in an A’s uniform. I remember asking the fan “where the heck did you get that?” and asking if I could keep one for myself. That is a day I will never forget! While growing up, I was a huge collector of baseball cards; I can remember taking bike rides to the local card shop with my friends to spend our weekly allowance on the hottest and newest cards. After a few years and once I really started getting serious with baseball my affection for cards kind of fizzled away, although I still believe I do have my collection in the attic back home. Back to this past week in the AFL with the Desert Dogs, it seems to me that our team is becoming more and more comfortable with each other, because there are a lot of pranks going around being pulled especially this week. I’ll give a little insight into our locker room; there is a game that originated with the Rockies players called “goggles”, where if you look into someone’s eyes while they are holding up their hands to look like goggles you must at that moment lie on the floor no matter where you are for 5 seconds. So yes we have guys laying down all over the locker room, while talking to fans or reporters! But the best spot to “get someone” seems to be the shower (ha-ha); however, there are some rules and the biggest rule being that the game stops when we exit the clubhouse to take the field for the game. Other pranks include shaving cream in shower shoes or the freezing of a teammate’s dirty laundry in a bowl of water (which was absolutely hilarious). Also, there is Shane Lindsay’s “Missing Toothbrush” in which someone seems to steal it at least 3 times a week. I know these pranks may sound a bit childish but it does keep the clubhouse loose and promotes good camaraderie. Thanks for checking in and enjoy your week. I look forward to writing again. Welcome back Sports Fans and thanks for taking the time to check out this week’s installment of my blog. It was an exciting week in the AFL with lots of great performances. 5 out of our 6 games this week were won or lost by one run. The Phoenix Desert Dogs went 3-3 to improve their record to 5-6 which is good enough for second place in the National division. Let’s start with a little recap of last weeks games, early in the week on Monday we received a great performance from infielder Rusty Ryal (Diamondbacks), with 2 home runs in our 3-2 victory over the Javelinas. Tuesday’s game showcased a come from behind victory on the road by the Desert Dogs. Leading the way was Ryan Patterson (Blue Jays) with a 2 run homerun in the top of the 9th followed later by Scott Campbell’s (Blue Jays) game winning RBI single to give us 3 runs in the frame. Let’s skip ahead to Friday’s game where the Desert Dogs experienced their first walk off victory in the AFL with Eric Young Jr.(Rockies) singling to center to score Ryan Patterson. As for me, I pitched in our 8-2 loss to the Peoria Saguaros on Thursday. I pitched 2 innings giving up no runs on 4 hits while striking out 4. It was nice to be able to throw two innings in the same game since the norm for relievers in this league seems to be just pitching one. Thursday was also a great day for me personally because I was able to see some familiar faces. My dad flew in early Thursday afternoon and will be staying with my uncle until Tuesday, who lives in Peoria. Also, my pitching coach from college, who was in the area scouting for his new program Villanova, was able to attend the game. I was thankful to be able to get some innings in while my dad, uncle, and coach were at the game. Whether it’s during the regular season or during fall baseball in Arizona, it’s always nice to see family and friends, because as much as we all love baseball it does bring you back to the real world just a little bit. As for the weekend, Sunday is our off day from baseball, so I figured that would be a great day to be able to spend some time with the family. After catching up on some sleep, it was time to head to the Arizona State Fair located in Phoenix to meet up with my dad, uncle and cousin. I really was hesitant at first to jump on the crazy rides that they had there, but I felt obligated to ride because I really didn’t want my little cousin to show me up. So after about 3 or so hours walking around winning prizes and experiencing some rollercoaster’s and rides we headed back to Peoria to watch game 7 of the ALCS and to have a nice Sunday dinner prepared by my Aunt. I look forward to writing again next week and please don’t hesitate to ask questions. Hello again Sports Fans from Phoenix AZ. Well week 1 is officially in the books and the Phoenix Desert Dogs emerge 2-3. Since we had a little over a month off of baseball after the regular season everyone was clearly itching to get back onto the field and play. I was even wondering to myself about how it would be to face hitters again and how I could knock off some of the rust that might have accumulated since bullpen sessions can only get you so far. All I know is that we were all excited about getting back into a baseball routine. The atmosphere in the locker room went from being on practice day 1 like the first day of high school to that of college graduation on game day where you could feel the excitement in the air and the “get to know you curve” was completely out of the locker room. Our first AFL game featured an outstanding pitching performance from Max Scherzer (Diamondbacks) who went 7 innings giving up 2 runs on 4 hits, but in the end the Desert Dogs fell short falling 3-2 in 10 innings. With Max having experience in the “Big Leagues” it was nice to see first hand how he went about his business both on the field and in the dugout. I always like to talk to and take some mental notes from guys that have had experience at a higher level of baseball than me. They say you learn something new everyday. The second game was held in Mesa which was the first of three road night games. Getting to the field at 4 and after batting practice, I was told by our pitching coach that I would definitely be pitching because that Oakland A’s front ofice personnel would be attending. I was immediately enthused to be given an opportunity to show what I can do, but hey that’s what this league is all about! I came into the game in the fifth inning with the Desert Dogs winning 5-4; it was nice to be able to come into the game with our team ahead and looking for our first win. I pitched a scoreless fifth giving up two hits while striking out two and helped the Desert Dogs earn their first win. The game was highlighted by catcher J.P Arencibia’s (Blue Jays) opposite field game winning homerun in the 5th inning that would have gone out of any stadium. I pitched again on Friday against the Scottsdale Scorpions and I ran into a little trouble in this inning, giving up one run on 3 hits but most importantly getting a groundball double play that helped limit the damage. Lefty reliever Daryl Harang came into the game and finished the inning by striking out the last batter. The bats really came alive on Saturday and broke out with 9 runs on 13 hits; including Sean doolittle’s 2 homeruns en route to a 9-4 victory to collect our second win of the young season. The game was a 12:30 start, whch was great because we had plenty of time to get back home and catch up on some college football and also look forward to our off day on Sunday. During the course of the past week away from the field we have had a lot of down time. Early in the week a few of my Oakland Teammates (Sean Doolittle, Andrew Carignan, and Jared Lansford) and I moved into a house that we rented in Scottsdale. Along with moving into our new place our week was filled with some workouts at our minor league facility, trips to Fashion Square Mall, and even playing some video games online with Desert Dogs teammates. But most importantly was watching my hometown Phillies take a 2-1 lead in the NLCS. Thanks again for checking in this week, see you at the ballpark! Hello Sports Fans and greetings from Phoenix AZ, the home of the Phoenix Desert Dogs of the Arizona Fall League. I would first like to introduce myself to you and give you a brief background of my career thus far. 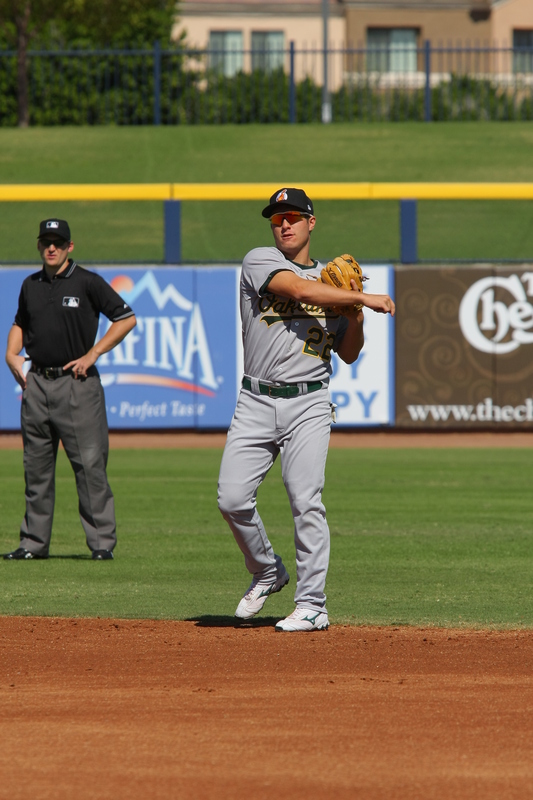 My name is Andrew Bailey and I am one of seven players in the Oakland Athletics organization that received the honor to play in the AFL. I am a right handed pitcher from New Jersey and was a sixth round selection in the 2006 draft. I played my college ball at Wagner College in Staten Island New York and received a degree in Finance. Since the draft in 2006, I have been able to play in several cities across the country and even found time to visit our neighbors to the north. These cities include Vancouver BC, Kane County IL, Stockton CA, and this past season playing in Midland TX as well as numerous bus rides to the opposition’s home field cities. Now I land in Phoenix AZ, with the anticipation of learning and gaining more baseball knowledge and also furthering my career in the game of baseball. I will be a part of the Phoenix Desert Dogs as a relief pitcher which will be somewhat of a new role for me. Throughout my career I have always been a starting pitcher until this year when it seemed as if I hit a bump in the road and started to really struggle for the first time. Halfway through this past season I was asked by the Oakland A’s to try a role in the bullpen, which I took as an opportunity to show how versatile I could be. I learned a lot about the game of baseball and also found out a lot about myself as a player in general. In the AFL for the next seven weeks I hope to obtain more information and truly discover myself as a reliever against premier players in the game of baseball. When we arrived to Arizona about a week ago, we entered the clubhouse on the first day of practice to find ourselves introducing one another to our new teammates from four other organizations, which include the Twins, Diamondbacks, Rockies, and Blue Jays. It was nice to finally meet and interact with the players you have been competing against for the past three seasons. Our manager Stan Cliburn (Twins) let the players meet and greet one another before introducing himself and the rest of the coaching staff. After a week of practices and getting to know our teammates and coaches better we will be starting games on Tuesday October 7th. For the down time when we are not on the field playing games here in Arizona I am looking forward to watching my hometown Phillies in the MLB playoffs and enjoying the NFL season while closely following my beloved Eagles. Please feel free to leave comments and ask questions as I will be happy to answer.